Blend of golbosa and haageana types in a range of colours and forms. Fresh or dried cut flower. 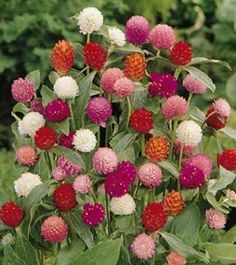 Gomphrena seeds are best soaked overnight, then sow either indoors at the beginning of April or outside after the frosts have done their stuff. I prefer to start some off in pots with a thin covering of vermiculite over the seeds as they like some light to germinate. Drought tolerant and will thrive in most soils…but likes a sunny spot.